Many behavioral and technological innovations appear in the archaeological record of Eurasia between about 45,000 and 24,000 years ago. This period has been termed the "initial Upper Paleolithic" and is largely associated with movements of modern humans into that part of the world and/or the complex interplay between population movements and environmental, demographic and cultural influences. Paleolithic cultural development in eastern Asia is generally thought significantly different from that of the western Old World. In particular, the Chinese Paleolithic was dominated by simple core and flake tool industries, and Middle Paleolithic technologies (e.g., Levallois) were absent or appear very late in the record. In contrast with the western Old World, a distinct “Middle” Paleolithic has not yet been identified in China and broader eastern Asia. Nevertheless, major technological and cultural changes did occur in the northern China about 30,000–27,000 years ago in the form of an “initial Upper Paleolithic”, termed the "initial Late Paleolithic" in China, although these assemblages are extremely limited in number. Shuidonggou is presently the most important site complex for the initial Late Paleolithic in northern China. In a paper published online July 10, 2012 in the Journal of Archaeological Science, an international research team reported new findings from a multidisciplinary research project led by Drs. GAO Xin and PEI Shuwen, Institute of Vertebrate Paleontology and Paleoanthropology (IVPP), Chinese Academy of Sciences, at the Shuidonggou site complex in northern China, a series of localities that date from the initial Late Paleolithic to the Neolithic, helping better understand the development of Paleolithic culture and the movement of modern human populations in North China. 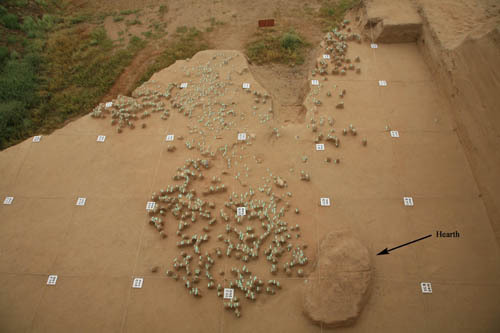 Since 2002, the IVPP and the Institute of Archeology of Ningxia Hui Autonomous Region have conducted a joint research program that focused on geomorphology, excavation and optically stimulated luminescence (OSL) dating of the Shuidonggou site complex, covering an area of over 50 km2. Six new Paleolithic sites (designated SDG7–12) were discovered and more than 100 artifacts were surface collected. Large scale excavations were conducted at five of the sites (SDG2, SDG7-9, and SDG12). During these recent excavations, new cultural horizons have been identified and more than 50,000 Paleolithic stone artifacts recovered. The assemblages include blades and microblades, large numbers of vertebrate fossils, some ostrich eggshell beads, hearths, pigments and bone tools. Dating results suggest that human occupation of the Shuidonggou area occurred during the Late Pleistocene to Middle Holocene (∼32,000–6000 years ago). Some sites are characterized by small, irregular flakes, casually retouched tools (modified or informally retouched tools, i.e., non-standardized tools with sporadic retouch which was not well controlled), and small numbers of blades or no blades. Other lithic assemblages are dominated by blades and microblades. At two sites, higher quality or exotic raw materials were exploited, but at the majority of sites locally-available river cobbles were used. In addition to blades, microblades and hearths, more than 80 finely-perforated and polished ostrich egg-shell beads, mostly colored with red ochre, were recovered from three sites. Several worked bone needles and an awl were also uncovered from the youngest site, SDG12, in deposits dating about 13,000 years ago. The data suggests there were two peaks of occupation falling around 32–24,000 and 13–11,000 years ago. “The new discoveries and dates indicate that modern humans are present at Shuidonggou close to 33,000 years ago, while the youngest occupation occurs in the terminal Pleistocene, about 13,000 years ago. The Last Glacial Maximum is likely to have been too cold and dry for occupation in this part of northern China, and there is currently a paucity of sites at this time”, said PEI Shuwen, first author of the study, “The earliest human occupation at Shuidonggou is substantially younger than in the initial Upper Paleolithic from western Eurasia. Thus, it is quite plausible that modern humans migrated into northern China from western Eurasia during this time period, though there appears to be growing evidence that modern humans were present in Northeast Asia well before the occupation of Shuidonggou”. Overall, SDG9 and other sites (SDG 2, 7, 8 and 12) show the typical pattern of the initial Late Paleolithic. These characteristics include the production of blades with Levallois core reduction strategies, some use of small cores to produce bladelets, and some higher quality raw materials which may have been transported for a distance. “The SDG9 site suggests an abrupt appearance of blade technology about 29,000 years ago, likely coinciding with the eastward movement of modern human populations into the region”, said GAO Xin, coauthor of the study, “It is clear that modern humans were responsible for the Shuidonggou initial Late Paleolithic in North China, but the pattern of more advanced small tool industries in the rest of China still remains to be explained”.